Popper, R. (2008) Foresight Methodology, in Georghiou, L., Cassingena, J., Keenan, M., Miles, I. and Popper, R. (eds. 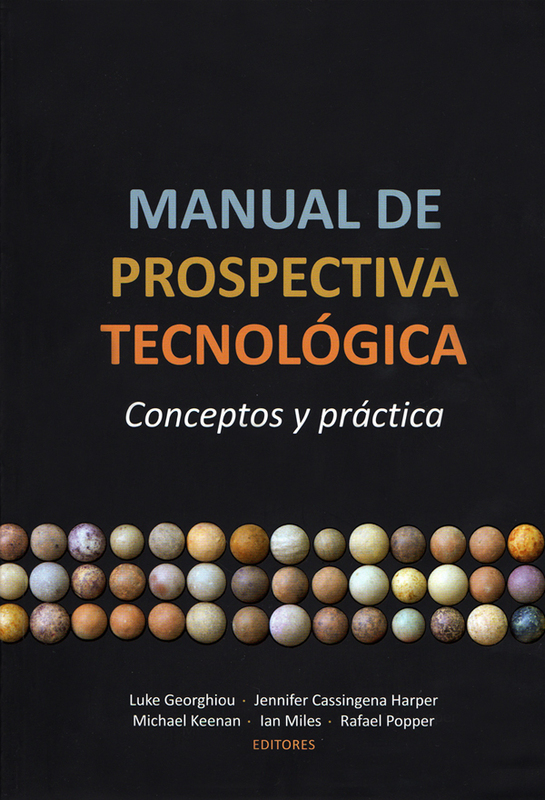 ), The Handbook of Technology Foresight, Edward Elgar, Cheltenham, pp. 44-88. This section presents one of the most common frameworks for classifying foresight methods. Here I also provide short definitions for 33 foresight methods. The framework is focused on types of techniques (qualitative, quantitative and semi-quantitative). Methods providing meaning to events and perceptions. Such interpretations tend to be based on subjectivity or creativity that is often difficult to corroborate (e.g. opinions, brainstorming sessions, interviews). Here you can find very short description of 19 qualitative methods listed in alphabetical. Backcasting is an approach that involves working back from an imagined future, to establish what path might take us there from the present. One version of backcasting involves simulation modelling – indeed, this method is much employed with planning models. More commonly, backcasting is used in aspirational scenario workshops. Brainstorming is a creative and interactive method used in face-to-face and online group working sessions to generate new ideas around a specific area of interest. Aiming at removing inhibitions and breaking out of narrow and routine discussions, it allows people to think more freely and move into new areas of thought, and to propose new solutions to problems. Citizen Panels are groups of citizens (members of a polity and/or residents of a particular geographic area) dedicated to providing views on relevant issues, often for a regional or national government. The panel is more than a conventional opinion survey, since its members are encouraged to deepen their understanding of the issues involved. Conferences/Workshops are events or meetings lasting from a few hours to a few days, in which there is typically a mix of talks, presentations, and discussions and debates on a particular subject. The events may be more or less highly structured and “scripted”: participants may be assigned specific detailed tasks, or left very much to their own devices. Essays/Scenario Writing involves the production of accounts of “plausible” future events based on a creative combination of data, facts and hypotheses. This activity requires insightful and intuitive thinking about possible futures, normally based on a systematic analysis of the present. Expert Panels are groups of people dedicated to analysing and combining their knowledge concerning a given area of interest. They can be local, regional, national or international. Panels are typically organised to bring together “legitimate” expertise, but can also attempt to include creative, imaginative and visionary perspectives. Genius Forecasting is an activity carried out by respected individuals that requires both expertise and creativity in relatively similar proportions. It involves the preparation of forecasts based on insights of a brilliant specialist, scientist or authority in a given area. Interviews are often described as “structured conversations” and are a fundamental tool of social research. In foresight they are often used as formal consultation instruments, intended to gather knowledge that is distributed across the range of interviewees. This may be tacit knowledge that has not been put into words, or more documented knowledge that is more easily located by discussions with experts and stakeholders than by literature review. Literature Review (LR) represents a key part of scanning processes (see below). Good reviews generally use a discursive writing style and are structured around themes and related theories. Occasionally the review may seek to explicate the views and future visions of different authors. Morphological Analysis is closely related to relevance trees (see below), and to the soft-systems approach since it helps both complex problem-solving and management of change; it may be used in planning or scenario development. It maps promising solutions to a given problem and determines possible futures accordingly: the classic applications have involved systematically working through the entire range of conceivable technological solutions for a particular goal (such as attaining a manned mission to the moon). 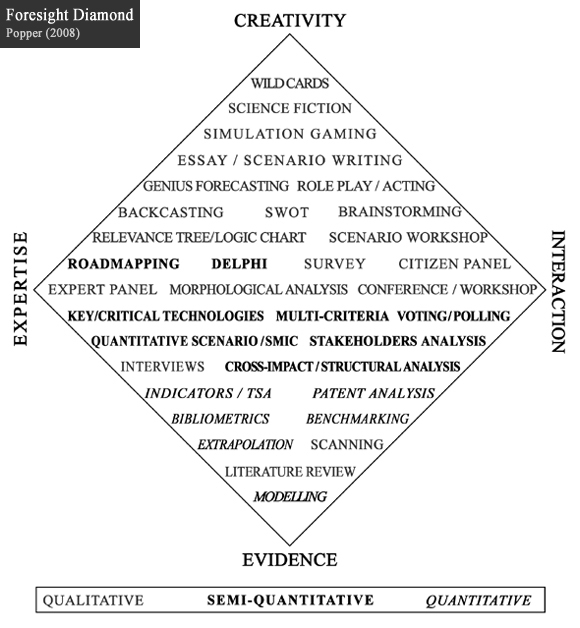 Relevance Trees and Logic Charts are methods in which the topic of research is approached in a hierarchical way. Each begins with a general description of the subject, and continues with a disaggregated exploration of its different components and elements, examining particularly the interdependencies between them. Role Play/Acting requires reflection, imaginary interaction and creativity. The method tries to answer questions such as: If I were person X, how would I deal with problem Y? Or, if we were country X, what would be our position with regards to issue Y? Scanning (often termed “environmental scanning” or “horizon scanning”) involves observation, examination, monitoring and systematic description of the technological, socio-cultural, political, ecological and/or economic contexts of the actor in question – a country, industry, firm, organisation, etc. Scenarios refers to a wide range of approaches involving the construction and use of scenarios – more or less systematic and internally consistent visions of plausible future states of affairs. Generally scenarios involve several features of the object of study, not just one or two parameters. They may be produced by means of deskwork, workshops or the use of tools such as computer modelling. Science Fictioning (SF) is an activity that deals with stories assuming that possible events which have not yet materialised have taken place, usually at some point in the future, and elaborates on the consequences of this. Because it involves fictional narrative – and much commercial science fiction is driven more by the need to have adventure or surprise – the method is not very commonly linked to serious governmental or business policy-making. However, it is quite common for scenarios to be illustrated in reports by brief vignettes which use SF-like techniques to illustrate one or other point of the imagined future world. Simulation Gaming is one of the oldest forecasting and planning techniques, in that war gaming has long been used by military strategists. It is a form of role-playing in which an extensive “script” outlines the context of action and the actors involved. There have long been technological aids used here, such as model battlefields, and now computer simulations. Surveys, like interviews, are a fundamental tool of social research, and are widely used in foresight. A questionnaire is distributed or made available online, and responses drawn from what is usually hoped to be a large pool of respondents. High participation rates generally require attractive and clear design of the survey instrument. SWOT Analysis is a method which first identifies factors internal to the organisation or geopolitical unit in question (resources, capabilities, etc.) and classifies them in terms of Strengths and Weaknesses. It similarly examines and classifies external factors (broader socio-economic and environmental changes, for example, or the behaviour of opponents, competitors, markets, neighbouring regions, etc.) and presents them in terms of Opportunities and Threats. Wild Cards & Weak Signals (Wi-We) are types of analysis that are usually carried out by small groups of highly skilled people capable of combining expertise, examining data and creative thinking. Wild Cards are situations/events with perceived low probability of occurrence but potentially high impact if they were to occur. Weak Signals are unclear observables warning us about the probability of future events (including Wild Cards). They implore us to consider alternative interpretations of an issue’s evolution to gauge its potential impact. Quantitative methods: Methods measuring variables and applying statistical analyses, using or generating (hopefully) reliable and valid data (e.g. socio-economic indicators). Many quantitative methods are used in foresight, for providing an evidence base for futures thinking, or supplying forecasting tools themselves like trend extrapolation. Here you can find very short description of 6 quantitative methods listed in alphabetical. Benchmarking is a method commonly used for marketing and business strategy planning and has recently become more popular in governmental and inter-governmental strategic decision-making processes. The main question here is what others are doing in comparison to what you are doing. Bibliometrics is a method based on quantitative and statistical analysis of publications. This may involve simply charting the number of publications emerging in an area, perhaps focusing on the outputs from different countries in different fields and how they are evolving over time. Impact analyses examine citations to assess, for example, the most influential pieces of work in specific areas. Indicators/Time Series Analysis (TSA) involve the identification of figures to measure changes over time. Indicators are generally built from statistical data with the purpose of describing, monitoring and measuring the evolution and the current state of relevant issues. Modelling generally refers to the use of computer-based models that relate together the values achieved by particular variables. Very simple models may be based on statistical relations between two or three variables only – even extrapolation is an elementary form of modelling (in which time is one variable). More complex models may use hundreds, thousands, or even more variables; econometric models are routinely used in economic policy-making, for example, and are “calibrated” from economic statistics and statistical analyses of their interrelations. Patent Analysis often resembles bibliometrics, but uses patents rather than publications as its starting point. Quantitative analysis utilises statistical methods to look at the number of patent registrations, assuming that increasing or decreasing registrations would (apparently) indicate, for example, low or high potential for technology developments in a specific area. More qualitative analyses may focus more on the contents of the patents. Trend Extrapolation/Impact Analysis are among the longest-established tools of forecasting. They provide a rough idea of how past and present developments may look like in the future – assuming, to some extent, that the future is a kind of continuation of the past. Recently, the concept of Megatrends has become popular to refer to macro level phenomena which include various (sometimes conflicting) sub-phenomena (e.g. globalisation, ageing, climate change). On the other hand, Impact Analysis aims to identify potential impacts that major trends or events would have on systems, regions, policies, people, etc. Semi-quantitative: Methods that apply mathematical principles to quantify subjectivity, rational judgements and viewpoints of experts and commentators (i.e. weighting opinions or probabilities). This section describes 8 semi-quantitative methods which apply mathematical principles to manipulate data derived from subjectivity, rational judgements, probabilities, values and viewpoints of experts, commentators or similar sources. Cross-impact/Structural Analysis (SA) attempts to work systematically through the relations between a set of variables, rather than examining each one as if it is relatively independent of the others. SA requires that a set of key variables are determined in order to understand the system that is of concern. Usually, expert judgement is used to examine the influence of each variable within a given system, in terms of the reciprocal influences of each variable on each other – thus a matrix is produced whose cells represent the effect of a variable on each other. Delphi is a well-established technique that involves repeated polling of the same individuals, feeding back (sometimes) anonymised responses from earlier rounds of polling, with the idea that this will allow for better judgements to be made without undue influence from forceful or high-status advocates. The technique was developed so as to circumvent “follow the leader” tendencies of face-to-face exchanges, and other problems such as the reluctance to discard previously stated opinions. Key/Critical Technologies methods involve the elaboration of a list of key technologies for a specific industrial sector, country or region. A technology is said to be “key” if it contributes to wealth creation or if it helps to increase quality of life of citizens; is critical to corporate competitiveness; or is an underpinning technology that influences many other technologies. However the method is implemented (expert panels or surveys, for instance) it implies some prioritisation process (such as voting, multi-criteria and/or cross-impact analysis). Multi-Criteria Analysis is a prioritisation and decision-support technique specially developed for complex situations and problems, where there are multiple criteria in which to weigh up the effect of a particular intervention. The method works by asking participants to assess the importance of various evaluative criteria, and the impact of a series of options, policies or strategies in each of the criteria. Polling/Voting refers to the use of voting or survey methods to gain an assessment of the strength of views about a particular topic among a set of participants. These may be members of a workshop, for example, who make a show of hands, place post-it stickers on one or other category on wall posters, enter views into a computer system, etc., to indicate how probable, uncertain, or important they consider events to be, which actions are priorities and how feasible alternatives are, and so on. Quantitative Scenarios/SMIC take various forms. One version involves quantification of the contingencies that bring about the scenario. Sometimes probabilistic analysis is established via expert opinion in order to build a system which evaluates the likelihood of occurrence of certain events. Roadmapping is a method which outlines the future of a field of technology, generating a timeline for development of various interrelated technologies and (sometimes) including factors like regulatory and market structures. It is a technique widely used by high-tech industries, where it serves both as a tool for communication, exchange, and development of shared visions, and as a way of communicating expectations about the future to other parties (e.g. sponsors). Stakeholder Analysis/MACTOR are strategic planning techniques which take into account the interests and strengths of different stakeholders, in order to identify key objectives in a system and recognise potential alliances, conflicts and strategies. These methods are quite common in business and political affairs. In futures work, there are techniques such as MACTOR that take this further, systematically considering whether stakeholders are in favour of or against particular objectives, and representing the situation in terms of matrices that can be formally analysed.